What is it that we see when we look out of our eyes onto the world? Most of us believe that we’re directly seeing the image that light is forming as it comes into contact with our eyes. What really happens is quite a bit more complicated than that. I want to talk today about stabilized images. What the brain actually does is use the light signals coming in from the eyes as a sort of starting point. That initial data is then loaded into the brain’s virtual reality model where it is processed. The sensory information is run through all kinds of algorithms, and then after being segmented into regions, objects, and so on, we then have our conscious perception of interacting with the world – for example, seeing a circle on the computer screen. Learning the subtleties of this process is very interesting. Let’s do a quick test. Stare at the black dot in the center of the image below. If you’ve never done this before, you’ll find it quite amazing as the gray circle fades away into the white background of my website. Now if what you saw with your eyes was the light directly landing on your retinas, then why would the gray circle fade into the background? This is a vision experiment illustrating what’s called stabilized images. I’ll let my book, Vision Science: Photons to Phenomenology, discuss the topic in detail. 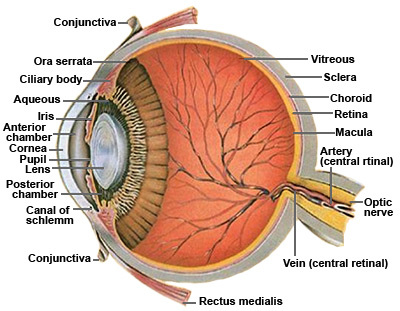 Before we move on, let’s take a brief moment to discuss the eye and its blood vessels. The human eye ball is laid out rather strangely. Many engineers who have looked at the “design” of the eye give it a D. One of the main problems with its design is that its blood vessels are strewn out in front of the retina. It’s kind of like building a camera yet deciding to leave all the wiring to in front of the CCD plates (the digital circuitry which collects light). As you can see, these blood vessels are blocking the light coming into our eyes, and should be present in the image that is coming into our brains. But why don’t we see them? Well, if the brain didn’t process the image and filter out the junk, we would actually be seeing these structures. Like I’ve been saying, the brain builds up a virtual model which is what you consciously perceive. The data coming into your eyes is just starting data which it works with. If you have a small penlight, you can place it near the outer corner of your eye. If you shake it up and down, the light will cause the blood vessels to leave shadows on your retinas, and this structure will become visible. The reason you can’t see it now is because your brain has adapted to it. Now let’s get back to Vision Science. What comes next will really blow your mind if you sit and think about it. What is this saying? Why do I find this so incredibly important? Well, what you see and perceive is never the raw information coming in from your sense organs. In the case of looking at something with your eyes, say one colored circle within another, your brain looks at the color contrasts, which fires off in a certain pattern based on the edges of the circles. These areas are then separated into “regions”, which is a sort of abstract mental concept. This is part of the object formation process. What you consciously perceive, in this case, are regions. I want to write a whole post on how we perceive objects sometime, but it’ll probably have to be four or five post series. Consider this a small taste of what’s to come! Next the book talks about a similar experiment to the one we started out with here. I can’t reproduce the image, however, because my scanner isn’t working. Basically it’s a gray circle, with a fuzzy white circle within it, with a black dot in the center of the central white circle. It’s very similar to the image I have in this post. 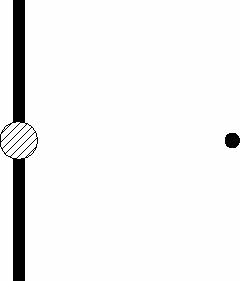 “You can experience a closely related phenomenon by staring at the dot in the middle of Figure 6.2.5 for a minute or so. Because you cannot hold your eyes steady enough to stabilize the inner edge completely, it has been made “fuzzy” so that the small movements of your eyes make involuntarily have only small effects on your visual system. 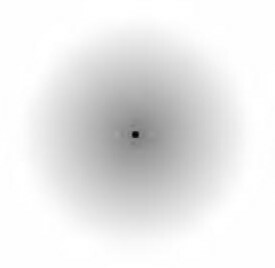 As a result, after staring at the black dot for long enough that your visual system adapts to the fuzzy inner contour, the light center region disappears and is filled in by the darker surrounding gray. If you then make a large eye movement, the inner region will reappear because the fuzzy edge is once again perceived. Last semester I had to take a political science course. I can remember oftentimes being bored and one time during the lecture I sat there closely staring into my teachers eyes. It’s not what you’re thinking. (LOL). She wasn’t directly looking at me, so it’s cool. I don’t think she noticed. If she did notice, I’m sure it was very awkward, but I’m so socially unaware, and I wouldn’t have noticed. She would’ve taken it the wrong way. She’s a lovely woman, but what I was actually watching was her eye movements. This was all in the name of science, you see. I have to have some way to entertain myself during lectures! She has really brilliant green eyes so they were easy to watch from where I was sitting. They were moving all over, back and forth, quickly twitching left, then right, up, down, left, and right. She wasn’t conscious of this. All of our eyes do it. I’m not 100% certain of this, but I think that if our eyes didn’t do that, and we sat still, everything would quickly fade away, just like that circle you were staring at earlier. We’d have to jerk our heads back and forth in order to continue seeing. We’d sit for a moment, everything would start fading away, then we’d jerk to the side, sit for a few seconds, everything starts to fade, then we jerk the other way, sit for a moment… repeat ad infinitum for the rest of our lives. Speaking of her, she was a really fun teacher. I used to break into silent laughter during her exams, and then when I’d look up she’d be in my face, smiling and asking, “Jason, why are you laughing at my exam?” She had conceptual questions where she’d ask for real life examples of the concept she was asking about. I would leave her absurd answers. I would also draw elaborate doodles on all my tests and quizzes. I was going to draw one picture of me sitting in a desk, daydreaming, with a little bubble over my head with a Penrose triangle in it asking, “Dr. Pierce, why can’t I rotate this figure?” Then I thought, “Uh, that’s pretty nerdy Jason. You probably shouldn’t do that.” (Since when did I start being self-conscious?) Instead I drew the function f(x) = | 1 / (2-x) | and the asymptote x = 2. Then I drew a stick man on a motorcycle and he was going to try to ride to the top of the asymptote. A stick man news crew was there reporting, with the reporter exclaiming, “Man attempts the impossible! Stay tuned.” A religious man was cheering on the rider, “All things are possible to him that believes!” To the side there was the stick man astronomical society, and they had a giant telescope aimed at the figure. One of them was saying, “There’s no end in sight.” Then other stick men were debating infinity and what it would mean to cross the asymptote. “What would be beyond infinity?” I was rather proud of that drawing. Sorry about that. Drifted off into my neurotic little world. I want to talk about one final thing before I end this post – Dr. Pierce’s eyes. As they were jerking back and forth, they were also accommodating for her blind spot. The main reason I bring up blind spots is because there’s one interesting thing you have to think about. 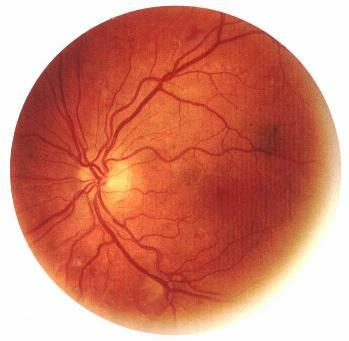 Both of our eyes have this gaping hole in the retinal image where all the wiring runs back into the brain. Take a look back at the figure. We don’t see an empty hole in the images we consciously see, so what’s going on there? Basically the brain just fills it in with a similar pattern to what’s going on around it. Take this blind spot test for example. Cover your right eye (or just close it) and stare at the right star. Move closer and closer to the screen and when you hit the right distance you’ll notice that the red star disappears from view. The brain just sort of fills in the space with the same white background. Or take this next blind spot test. On the left you’ll notice there’s a big circle and a bar. 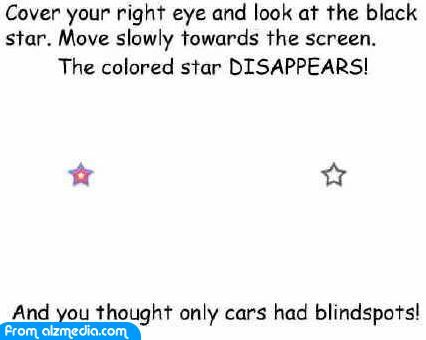 Cover your right eye again, stare at the right dot, and move toward the screen. Eventually that left circle will disappear into the blind spot. What does your brain do? Does it just leave a hole there? Nah, it just makes stuff up. It decides to fill in the space with the bar. To a large extent, the brain takes in information and then makes a best guess as to what it’s looking at. It then feeds the best representation it can come up with to your consciousness. In my next post on all of this, I want to talk about how we perceive objects and shapes. I’ll cover the sorts of processes our brain performs when it sees everyday objects around us. Until next time. Jason, from what you describe of the ingenious little cartoon you drew on one of your exams, I think you might have a secondary career as a, albeit geeky, cartoonist. 😉 You could post some of them in this forum. You had me in a fit of laughter with your stick figure drawing description. I’m enjoying your posts on visual perception, please write more! I just wanted to say thank you for explaining this in a way even I can understand. I’ve always hated science because it always seemed like a foreign language to me. I just happened to come across your forum because of something I read about “forbidden colors”. That really caught my attention because of what it said about seeing purple like you’ve never seen it before. Purple is my favorite color. I thought that was pretty cool. I’ll have to do some more research on that. I know it’s been a while now since this was written, not sure if you’ll see this.